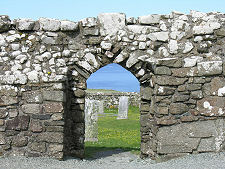 The ruin of Trumpan Church stands on a site overlooking the sea at Trumpan. This is as far as the public road goes along the west side of the Waternish Peninsula, though it is still nearly four miles short of the peninsula's tip at Waternish Point. Trumpan was once a thriving medieval township, and this simple rectangular church served as its focal point. The story of both the township and its church came to an end on the first Sunday in May 1578. Trumpan Church has never been satisfactorily dated, but it could easily have stood here as far back as the 1300s. When in use it was known to its Gaelic-speaking congregation as Cille Chonain, or St Conan's Church. 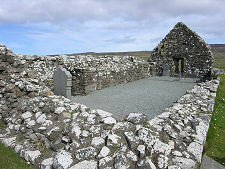 Today the ruin stands surrounded by its graveyard, home to a range of memorials covering a considerable period of time. 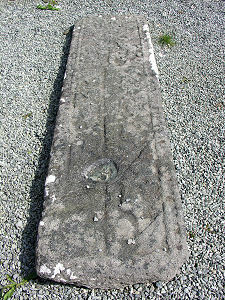 Perhaps the most striking grave marker is laid at the east end of the church and is decorated with the carving of a long claymore or Highland sword surrounded by animals and plants. In the 1500s, the MacDonalds and MacLeods were engaged in fierce clan rivalry. 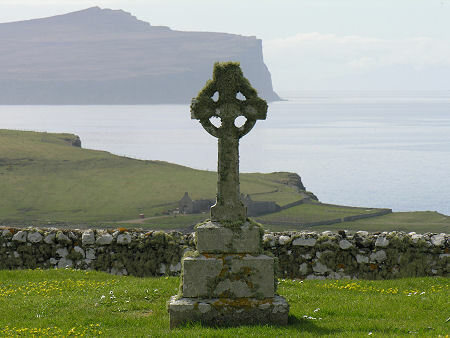 This came to a head in 1577 when a raiding party of MacLeods of Skye landed on the island of Eigg. The resident MacDonalds took refuge in a cave on the south side of the island. The raiding party lit a fire in the entrance to the cave in an attempt to force those hiding inside to come out. The result was the suffocation of 395 MacDonalds, the entire population of the island. 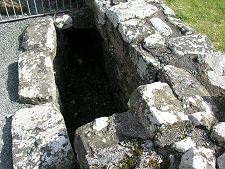 The cave, now known as Massacre Cave, can still be visited on Eigg. Revenge was not long in coming. 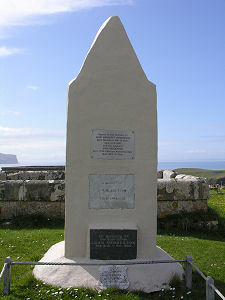 On the first Sunday in May 1578, eight birlinns or war galleys of the Clan MacDonald of Uist landed in Ardmore Bay, immediately to the west of Trumpan. 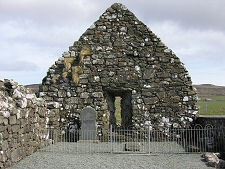 The resident MacLeods were gathered for Sunday worship in the church when the raiding party blocked the door and set fire to the thatched roof. The only MacLeod to escape alive was a young girl who managed to squeeze through a window. She raised the alarm, by some accounts after running to Dunvegan, ten miles away, and MacLeods from the wider area swiftly gathered. By now the MacDonald's had returned to their ships in Ardmore Bay, only to find them left high and dry by a retreating tide. The MacLeods are said to have unfurled their famed Fairy Flag, and in the battle that followed the entire MacDonald raiding party was killed. The bodies of the dead MacDonalds were lined up beside a dry stone wall or dyke, and were buried by the simple expedient of having the dyke pushed over on top of them. The battle has since been remembered as "The Battle of the Spoiling of the Dyke". 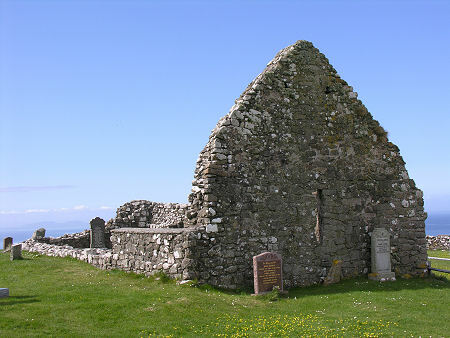 The township of Trumpan was never re-established, and the church has remained a ruin, albeit one with some deeply unpleasant memories of one of the more barbarous episodes in Scotland's history.